In the last five years, the .NET ecosystem has shifted from a single operating system stack to a full-stack cross-platform framework to be embraced by the open source community. The lessons learned from the last 18 years have been used to create the next journey of this popular development framework. One need was to shed the legacy technology that had been accumulating in the .NET Framework since the beginning. Another was to allow the .NET Framework to run on the three major operating systems that exist in the world of computers and the Cloud. The final push was the embrace of open source after Satya Nadella was promoted to CEO of Microsoft in 2014 along with the development of the Roslyn C# compiler and the acquisition of Xamarin. This eMag is a set of visions from 7 authors to bring ideas to the new developers that are curious about the C# language and .NET Core as well as the entire existing .NET community that are starting to migrate there new projects and systems to this exciting new platform. 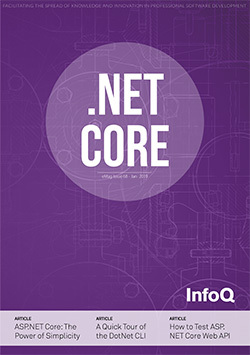 We start with the fundamentals of .NET Core regarding the simplicity and performance that developers can embrace and then move to the ways they can architect and develop their new applications. Each author in this eMag brings a unique approach based on their past work and shares a world of knowledge that we all can use in our daily work. I am very proud of the work we all have done bringing this to you and the entire developer community. I hope you enjoy this eMag and find it give you some ideas when you are using .NET Core for your web, mobile or Cloud applications. Happy reading! Stay ahead of the curve with the latest news and information about Pivotal. ASP.NET Core - The Power of Simplicity - With the release of ASP.NET Core, Microsoft went all in on Open Web Interface for .NET (a.k.a OWIN). OWIN provides a powerful way for developers to choose how much abstraction they want to have when dealing with web. Chris Klug provides an explanation of how the OWIN request pipeline works, as well as how you can utilize it to fulfill the requirements you have. Performance is a Key .NET Core Feature - .NET Core brings along many optimizations with regards to performance, both in terms of execution speed as well as memory allocation. Examples are optimizations in collections and LINQ extension methods, text processing, networking ... There are also new types and concepts, such as Span, that allow doing interesting things. In this article, Maarten Balliauwtakes a look at how these new concepts can be used. A Quick Tour of the cli - Arguably, the dotnet cli is one of the most useful features of the .Net Core wave of functionality. In this article, Jeremy Miller takes a look at how several .Net OSS tools take advantage of the dotnet cli and how you can use the new cli tooling in your own daily development. Distributed Caching with ASP.NET Core - ASP.NET Core applications deployed to the cloud can receive performance benefits from the use of distributed caching. Matthew D. Groves explores how Couchbase Server can serve this purpose well. Couchbase Server is a memory-first database that is great for use as a distributed cache, and ASP.NET Core makes it easy to utilize this database in your applications. Azure and .NET Core Are Beautiful Together - Eric Boyd explores how ASP.NET Core provides developers a way to develop modern web applications in the environment of their choosing (Linux, macOSX, and Windows). Microsoft Azure gives developers full power to host those web applications in anything from a full VM to a Docker container to Azure's App Service which simplifies management of the host environment. This lets developers focus on code and not servers. .NET Core and DevOps - .NET Core was designed with devops in mind, and Dave Swerksy covers in this article how the .NET Core projects can benefit from the build automation and application monitoring intrinsic to the platform. Swersky also shows how the command-line accessibility of .NET Core makes this easier to implement. Advanced Architecture for ASP.NET Core Web API - Chris Woodruff looks into how ASP.NET Core makes it easy to build a modern web API. This enables an implementation that is easy to design, test, and maintain. By using the Ports and Adapter Pattern business logic can be decoupled from API frameworks and data access. Testing ASP.NET Core Web API - In this article, Chris Woodruff investigates testing your ASP.NET Core 2.0 Web API solutions. Woodruff looks at internal testing with Unit Testing and externally testing your solution with a new testing framework in ASP.NET Core called Integration Testing.